As Floyd Ray, Palmer Ballroom artist from Los Angeles, stormed Eastern, Midwestern, and Southern spots, the stars above primed the band for the unrivaled acclaim it received. Left: John Alston, crooning vocalist. 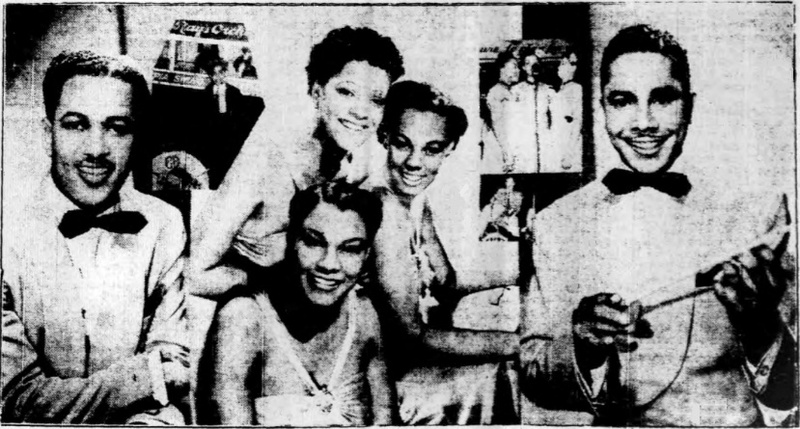 In the center is the Floyd Ray Swing EnsembleIvy, Von And Vern. These girls are three of the reasons why the Ray outfit "packed them in" at some of the best spots in the East. Right: Floyd himself in a familiar pose. Inset right: Ivy, Von And Vern "swinging on down" in the Tick Tock in New Orleans.